So sad to hear about most of you all getting sick. And time does fly so fast and now it’s end of August indeed. The mixed berry spoon cake looks and sounds delicious! I know what you mean…there are so many summer recipes on my list that I havent yet made! now this one is going in that list too :) I like the blueberry/raspberry combo. How do you store this cake? I am so sorry your family got sick. That is no fun. I hope everyone is well now. This dessert looks fabulous, great way to end the summer! Oh no sorry to hear you and your family got sick on your vacation! Happy to have you back though. I’m going to miss the summer fruit! Soon it will be back to apples, pears and oranges. I love how deliciously browned the top of this cake is. I’m sitting here thinking I’d like to go to Idaho just for a potato! 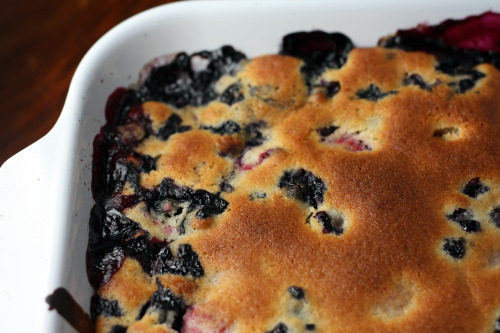 This cake looks like a lovely use of summer fruits, and it must smell amazing in the oven. So sorry to hear that so many of you were under the weather; especially all the best to those who required a hospital stay! Thank goodness that your littlest was spared. I have woken up sick today, getting progressively worse as the day’s gone on. Even though I am not in a mood to eat, the sight of this lovely cake is rather comforting. Bummer of a vacation! I remember one such vacation in the red Woods when my twins were only 18 months and and my eldest was 2 1/2 years old and we all got the stomach flu! (Yes, I had 3 kids in 1 year. They are now in their twenties) I hope you are all feeling right as rain in the Northwest. I totally get where you are coming from on feeling the pressure to use as much fresh produce as possible this time of year. Here’s to berries! Looks like a delish cake! Be well my friend. Happy Belated Anniversary! Sorry to hear you and your family were sick over the holidays. That cake looks delicious! Oh goodness, vacation is no time to get sick! Glad you were able to have a nice anniversary anyhow. This looks delicious and I am getting a ton of raspberries at the farm! This is gorgeous! I had made this cake too from the food & wine & loved every bit of it. Your picture is just very very beautiful! I know that summer fruit guilt! Glad I’m not the only one to feel it. What a sad vacation! Glad you managed some anniversary celebration, we have our 7th coming up soon, too. I am sitting here watching the blackberry bushes across the street get rained on. Summer is coming to an abrupt end around here isn’t it? Thanks for the reminder to hurry up and bake them into a yummy cake. Looks delicious!